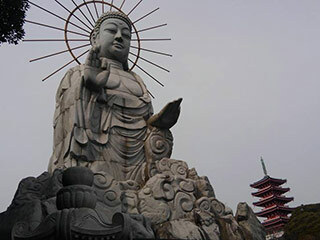 Miura Daibutsu (三浦大仏) is one of great Buddha Statue located in Miura, Kanagawa Prefectue. It is 13.5m tall, and 20m total with the basemen. It was constructed in 1983 and located in Kurihama Cemetery. There are also many beautiful stone Buddha Statues. Cation: This is private cemetery. Please stay in good manner and never disturb other visitors. 1. use Keikyu Line to Keikyu Nagasawa. Miura Daibutsu is 13.5m tall stone Buddha Statue located in Kurihama Cemetery, Kanagawa　prefecture. It was constructed in 1983. There are also 5 stories pagoda which is about 20m tall and many other stone statues. Kurihama Cemetery is belong to Jodoshinshu Buddhism Higashi Honganji Temple.